Feeling a little off? 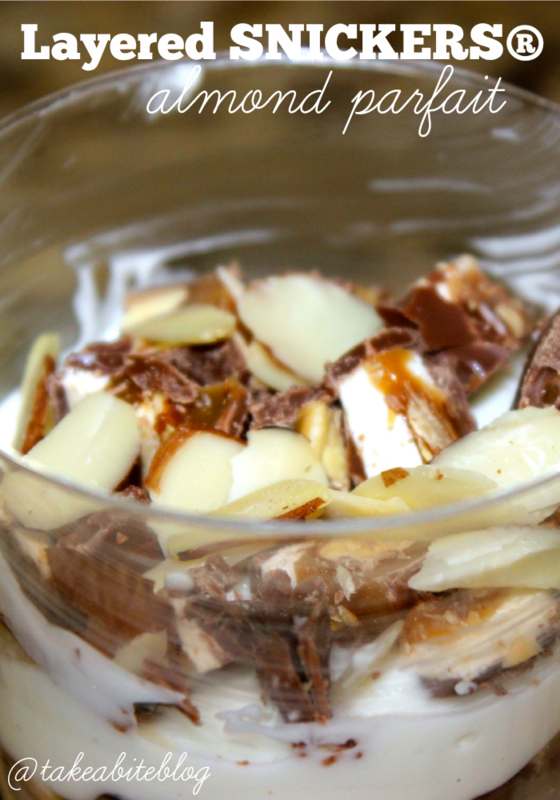 Treat yourself to a Layered SNICKERS® Almond Parfait and say goodbye to grumpy hunger pangs! I’m the worst person in the world to be around when I’m hungry. Ask my friends. They know. Ask my parents. They definitely know. The worst is when I’m waiting for someone to go out to dinner — and it’s been hours since I last ate — and they are taking forever. Not only does my impatience start to creep in, but that hungry-angry moodiness — I think they call it “hangry” — takes a front seat too. Moral of the story? Bring me a snack if you’re running late for our dinner plans and I’ll probably forgive you. Bring me a Layered SNICKERS® Almond Parfait and I’ll definitely forgive you. 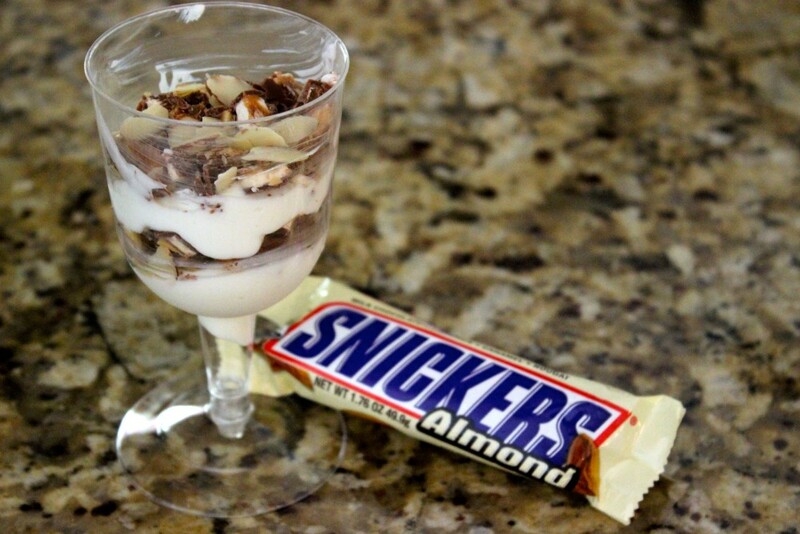 All the components of a Layered SNICKERS® Almond Parfait help to keep hunger at bay. Protein-packed greek yogurt and sliced almonds — we’re topping this parfait with a chocolate candy bar so, um, it’s best to keep the rest as healthy as we can, right? 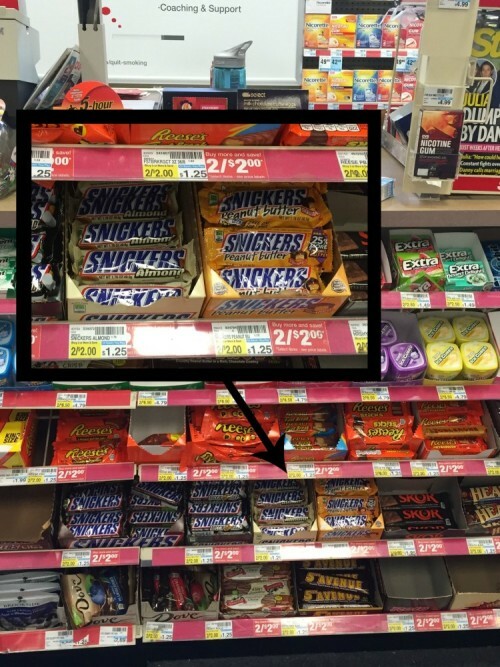 I was doing a little toiletry-shopping in CVS and when I got up to the counter to pay, my eyes wandered to the rows and rows of candy and chocolate, as always. The SNICKERS® Almond and SNICKERS® Extreme, Peanut Butter Squares both basically jumped off the shelf and into my basket. I swear, I didn’t do it! They needed me to buy them! I finally got over my aversion to nut-filled chocolate and now SNICKERS® are one of my favorites. I prefer them nice and cold, so I always keep them in the freezer. Then when you’re ready to dig in, all that chocolate-y deliciousness is solid but there is still a soft chewiness from the caramel and still lots of crunch from the peanuts and almonds. 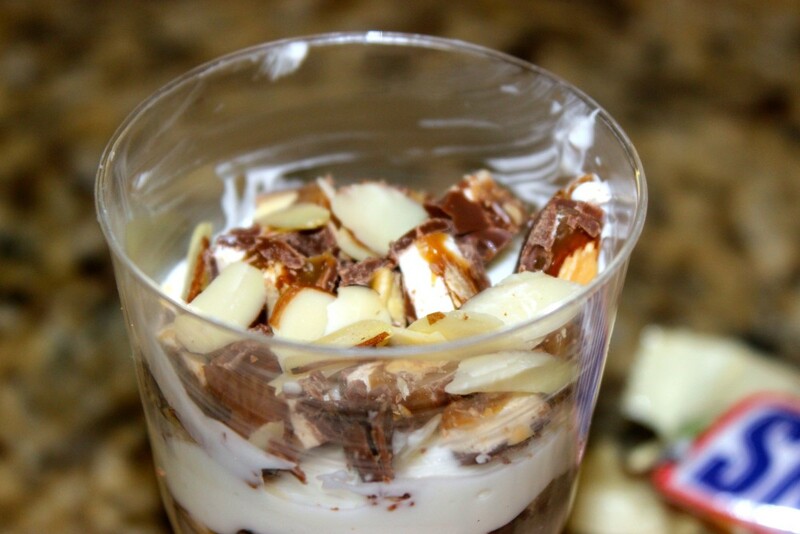 I know they are pretty delicious in this parfait, but there are so many other ways to use SNICKERS® in snacks and desserts. 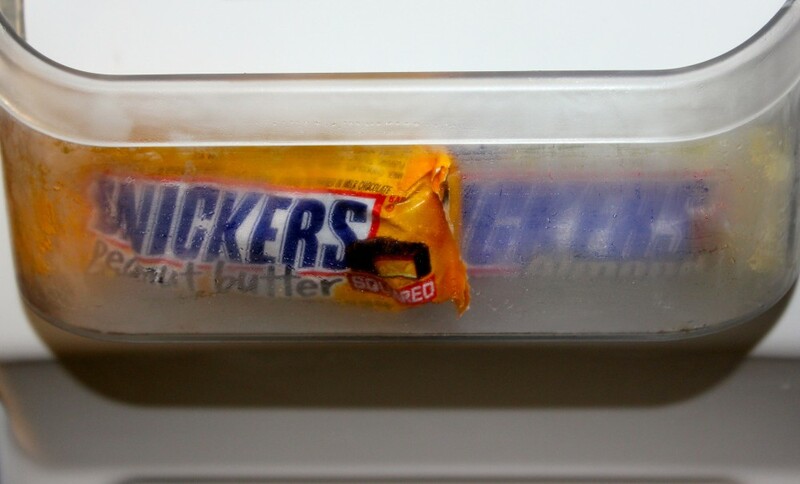 You can check out more great SNICKERS® recipes and fun stories on the SNICKERS® social hub. Who are you when you’re hungry? Can you relate to me and my “hangry”ness or are you still sweet as pie, even though your stomach is growling like a madman and practically reaching out for the closest crumb? Enter the SNICKERS® “Who are you when you’re hungry?” contest by uploading a personal photo or video from your Computer, Facebook, Instagram or use the SNICKERS® Meme Generator to create something new! Voting begins at Noon on 5/11/15 and ends at 11:59:59AM ET on 7/15/15. Now that you know about my total crabby-patty ways, tell me about yours. How do you survive “hangry”ness? Spoon in the first half of the yogurt into the bottom of a small glass or cup. Sprinkle with half of the sliced almonds. 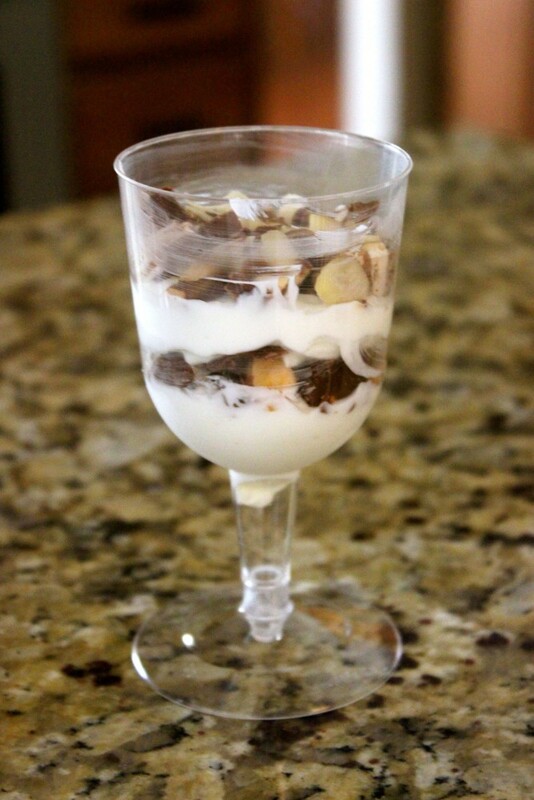 Fill the glass or cup with the rest of the yogurt and top with the remaining pieces of SNICKERS® Almond. Sprinkle with the remaining sliced almonds. I actually don’t get hungry much, which is super weird. But I would eat this hungry or not! LOL Laura that made me laugh, I’m glad you’d still eat it even if you weren’t hungry! Thanks, Katie, I totally agree!